Webster is chair emeritus of the Department of Infectious Diseases at St. Jude Children’s Research Hospital in Memphis. St. Jude is a World Health Organization Collaborating Centre forInfluenza and a National Institutes of Allergy and Infectious Diseases Center of Excellence for Influenza Research and Surveillance. Dubbed “Flu Hunter” by Smithsonian Magazine, Webster began his research in the field in the early 1960s and is among the first scientists to acknowledge a link between human and avian flu. 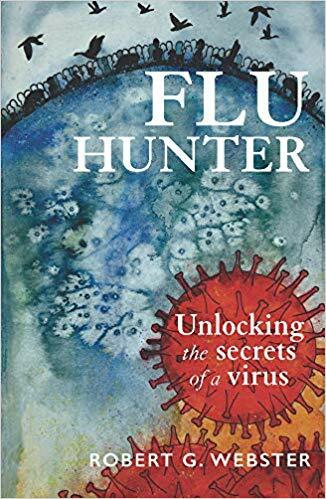 His new book, “Flu Hunter: Unlocking the Secrets of a Virus,” provides readers with a first-hand account of a lifetime of scientific detective work unlocking the secrets to one of the world’s deadliest viruses. “Flu Hunter: Unlocking the Secrets of a Virus” also contains warnings to heed today, particularly during the 100th anniversary of the deadliest influenza pandemic in modern human history. It has been Webster’s life work to figure out how and why this kind of pandemic is able to spread rapidly across the globe with high levels of mortality. Webster’s new book reveals some of the fascinating scientific work involved in researching the flu virus, including exhuming bodies of Spanish flu victims from Arctic permafrost in a search for tissue samples containing genetic material from the virus. This entry was posted in Uncategorized and tagged author, Flu expert, Flu Hunter, international, manuscript, Ph.D., Robert Webster, St. Jude Children's Research Hospital, Today's Honoree, writer. Bookmark the permalink.